Each month we email InvestigateWest members Sidebar, an exclusive dispatch from our newsroom. This month we’re publicly posting Lee Van Der Voo’s reflections on the state of the newsroom since the days of Spotlight, and what it means to you. Support InvestigateWest. Become a member today! First off, I was teary throughout the movie, not just watching the Academy Awards. “Spotlight” that is. What other movie is there? Oh, I saw the rest. “Amy.” “The Revenant.” “The Martian.” “Room”… They were great. OK, “The Martian” was just… OK. But “Spotlight.” That was like two hours in a journalist’s daydream, the kind in which investigative journalism matters like it did even 15 years ago. 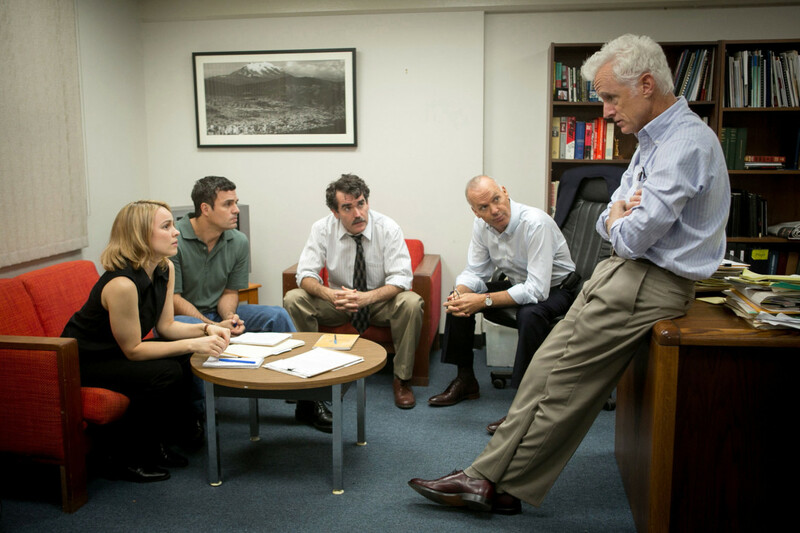 In those days, newsrooms everywhere had investigative teams toiling in dingy, subterranean offices, just like the The Boston Globe team in “Spotlight.” Newspaper publishers threw money at projects because they mattered to their readers. And they were wise people who said prophetic and inspiring things as in that scene where Liev Schreiber, playing Marty Baron, walks his staff through the post-production heartache that can accompany tough stories. Today I think I’d give an arm for that kind of institutional support. Rachel McAdams can play me, with or without the big newsroom backdrop. Lots has changed since the days of “Spotlight.” Newspapers have shed 17,7000 journalists and shuttered hundreds of products. A study by CareerCast, a web site that finds targeted job opportunities by industry, pegged “journalist” dead last in a ranking of the top 200 jobs in 2015, citing the continued squeeze on newsrooms that stems from the lost advertising revenue that once funded them. The future looks grim, too, with the U.S. Bureau of Labor Statistics projecting journalism jobs will contract by another 9 percent between 2014 and 2024. All this for a median wage of $37,200 a year. Sometimes I want a time machine to go back and tell my 18-year-old self, as I was about to enroll in college, that the internet would start shuttering my industry in another two decades. Which is why “Spotlight” is so important. And why I cried my eyes out at what was probably the wrong moment. It wasn’t that scene where Mark Ruffalo, as reporter Mike Rezendes, loses it when his editor Robby Robinson, played by Michael Keaton, holds the story from publication while children remain at risk. And it wasn’t when Brian d’Arcy James, playing Spotlight reporter Matt Carroll, is cautioned not to tell his neighbors after discovering a home for wayward pedophiles is just a few houses from his own. It was that scene on the porch, where McAdams, as the Spotlight team’s incredible Sacha Pfeiffer, tells a commiserating Ruffalo that she can’t go to church with her grandmother anymore. That she has lost her faith and doesn’t know if she can find it again. Every reporter has had to sacrifice faith of some kind to do the job. And I related to it more than I would like. Some things are better in journalism than they were 15 years ago. Thankfully, we don’t have to comb rulers through millions of pages of printed indexes to find what we are looking for anymore, like the “Spotlight” team. Most of the information they were ogling is available in digital form now. And our computer-assisted techniques have advanced dramatically since the Spotlight team tapped their findings into Excel, making combing such files much faster, which explains how we are able to break huge stories at InvestigateWest with the small team we have. The barriers to entry are lower than ever in journalism too, creating opportunity for new and marginalized voices, and for niche products I’m glad to see gain ground. Digital storytelling platforms — with audio, video, photography and print rolled into one — are better than in any pre-internet imagining. And we’ve got “Spotlight.” Proof that a new generation of tech billionaires stands ready to forge, through what looks to be a lot of trial and error, the Spotlight teams of the future. Pierre Omidyar, founder of eBay, partly funded the film while bankrolling new investigative teams through First Look Media projects like Intercept and Field of Vision. Amazon founder Jeff Bezos, now owner of the Washington Post, looks to be raising the value of journalism content, including investigative content, in the digital marketplace. And recent initiatives at Google, as it syncs up with the Center for Investigative Reporting and Hacks/Hackers to support journalism, show promise. It will take a while before these efforts remake what was lost. A long time to bring on new funders, create new platforms, and make the case, both with readers and with the foundations that support nonprofit newsrooms like InvestigateWest, that quality journalism is worth paying for. But I believe we’ll have a stronger national press for it in the end. That’s a great thing. I got weepy for that one, too. Best picture? You bet. InvestigateWest Executive Director Robert McClure was recently selected for the prestigious Knight Science Journalism Fellowship — read on to find out why he is returning to school for nine months.